An album launched on February 22nd, 2019: The 6th and 7th symphonies, along with stage music from 'King Lear', all by Dmitri Shostakovich, performed by the Boston Symphonic Orchestra, conducted by Andris Nelsons. 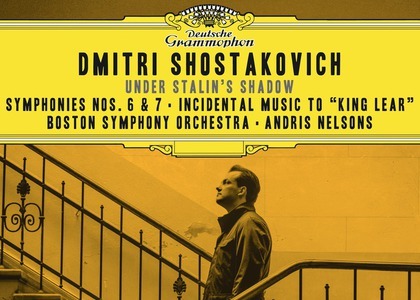 This album is part of a series titled 'Shostakovich in Stalin's shadow', recorded by the American orchestra, whose musical director is, since 2014, 40-year old Latvian conductor Andris Nelsons. The series, which already consists of three other albums, each awarded a Grammy- in 2016, 2017 and, most recently, 2019, when the album featuring the 4th and 11th symphonies received not only the prize for Best Orchestral Performance, but also for Best Sound. It seems unlikely, but it's true - three albums from the same series, all with Grammy awards, but it's the reflection of the extraordinary quality of the performance, and of the concept in general. Like in the previous albums from the series, the fourth one features live recordings - from February, April and May 2017. Concerts with an uncommon tension, where Andris Nelsons has gathered his experience of growing up in the Soviet Union and the troubled years that followed the collapse of communism. For a proper performance of Shostakovich, you need to understand exactly what his music is about, beyond the score. The 6th symphony was finished by Shostakovich in September 1939, along with the outbreak of the Second World War and the alliance between the Nazis and Soviets against Poland. Previously, there was a presumption that Shostakovich's 6th symphony was going to be dedicated to Lenin and include a big orchestral and choral part. In the beginning of 1939, Shostakovich said on the radio that after the tense 5th symphony, he wants to write a brighter, younger, spring-like work. But the feeling of imminent danger towards a history that was about to change lots of destinies also exists in the new version of this 6th symphony, which deviates from the traditional structure of a symphony, only having three parts, of which the first is the slowest and the longest. Shostakovich's 6th symphony had its Boston premiere in 1942. The same symphonic orchestra from Boston that performed it back then recorded this impressive version conducted by Andris Nelsons on this album 75 years later, in 2017. A series with three Grammy awards for the best orchestral performance and an award for the best sound - and this fourth album keeps the same standards of excellence that marked the previous publications. Furthermore, it expresses the original idea of the series - 'Shostakovich in Stalin's shadow' , which initially was supposed to have symphonies from the 5th to the 10th, composed until 1953 and directly influenced by the unstable relationship between Shostakovich and Stalin's regime. In 1936, Shostakovich was aggressively criticized by the Pravda newspaper for his masterpiece 'Lady Macbeth of Mtsensk' and became an outcast, waiting with his luggage by the door every night, to be deported to the Siberian gulag, along with other political convicts. That didn't happen, Shostakovich having already made a name for himself as an important figure. In 1948, he fell from grace in Stalin's regime for the second, being accused of formalism. It wasn't until after 1953, the year of Stalin's death, that Shostakovich felt relief. This is very obvious in the festive Overture he wrote in 1954, which should have been celebrating the anniversary of the Soviet October revolution, but instead expresses Shostakovich's feelings about the disappearance of Stalin, a tyrant with the blood of millions of victims on his hands. In March 1941, 'King Lear' premiered, with stage music by Shostakovich for the play, which was written by Grigori Kozintsev. Three months later, Hitler invaded the Soviet Union. Shostakovich's music seemed to anticipate this historical event, having a sense of imminent catastrophe like an aura around the music for 'King Lear', in obvious contrast to the festive Overture in 1954. It seems extraordinary to me, the way Andris Nelsons and the Boston Symphonic Orchestra captured all these historical aspects in their performance; beyond the accuracy and unity of the orchestra, there is this ability of recreating live paintings, where nothing leaves you indifferent: sadness and drama are experienced at the same intensity as feelings of joy and jubilation. I realize that those live concerts that were recorded on this album must have been really moving for the audience that attended them, if even a recording can preserve the emotions so well, that electrical power which seems to connect musicians and people.